A culture of hard drugs and violence remains rife at a Cheshire prison where gang members are recruited with £50 cash incentives, an inspection found. Staff at HMP Risley, near Warrington, are "struggling to cope" with the problems, said Chief Inspector of Prisons Anne Owers. More than 1,000 men are inmates at the Category C training prison. Bosses said the prison's violence reduction strategy had been reviewed and rewritten since the inspection. Ms Owers and her team conducted their unannounced inspection of the jail in April. Inspectors found that more than 60% of inmates suspected of using drugs such as heroin tested positive, and that the drugs were readily available. Inmates told inspectors gangs were offering joining fees of £50 cash, which left staff struggling to cope with the with "pervasive" drugs and gang activity, Ms Owers said. More than 50 prisoners were found with banned mobile phones in the first four months of 2008 and some were found making alcohol. More than a third of the inmates were locked in their cells for much of the day. Ms Owers said: "Worryingly, prisoners felt even more unsafe than in the past and a serious drug problem, with associated gang violence, was having a pervasive and pernicious effect. "The establishment's sprawling buildings and poor design added to the difficulties for staff, but there was no excuse for the squalor we found. "Risley also had insufficient purposeful activity to be an effective training prison, although better use could have been made of what there was." Phil Wheatley, director general of the National Offender Management Service, said he took the criticisms very seriously. He said: "Since the inspection the prison's violence reduction strategy has been reviewed and rewritten, an integrated tackling anti-social behaviour strategy has been introduced and a specialist gang management strategy is being developed in conjunction with the local police. "These measures are being implemented and will make the prison safer." 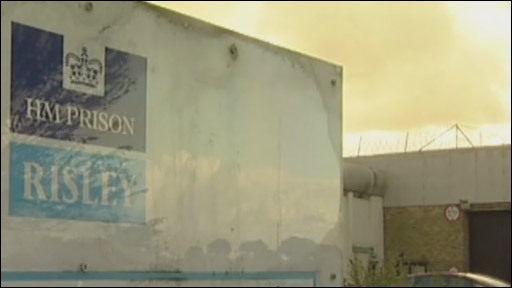 Prison Reform Trust director Juliet Lyon described the report as "shocking". She said: "In effect, despite the best efforts of many staff, the prison is an intense arena for gang allegiances to be acted out. "Vulnerable prisoners are rendered even more vulnerable and the brutalising impact of incarceration in such an environment can do little if anything to prepare people for a law-abiding life on release."